We had a wonderful evening a couple of weeks ago at the Newburyport Public Library celebrating autumn by making books with sticks for the binding. We met in the Children's Program Room which is a cozy space and there was a particularly good feeling of connection and camaraderie within the assembled group. I took screen shots from directions for the binding of the South Common Haiku Project that I did with my friend Paul Marion. They are different in the sense that the pages were stacked separately but I think they get the point across. 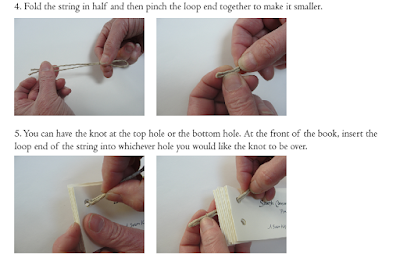 At the workshop we folded the pages together like a traditional Western signature and punched the holes. If you'd like to have a tie at the top and bottom holes, use slightly longer string, use the same loop to string it through, pull so that you have an even amount of string at each hole, cut the loop, and tie a knot around the stick at each hole. 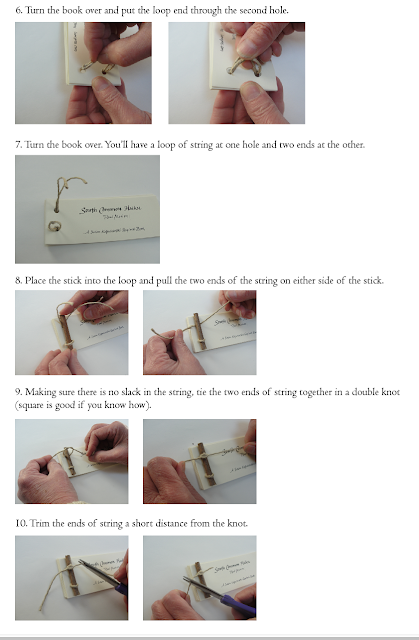 Why not celebrate the season with stick books of your own? I like this stick and string book even more than your stick and elastic book!